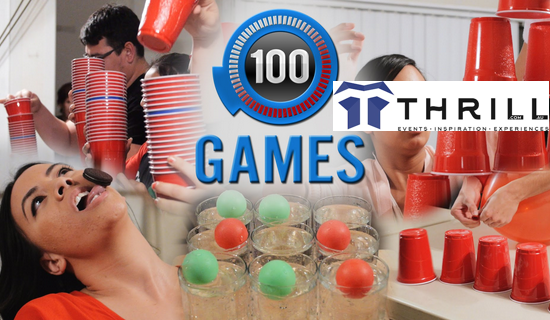 Thrill team events presents a series of awesome fun Minute To Win It Games as competitions for office, staff, evening entertainment or team building activities for corporate group events in and around Sydney! Great for Fun Work Party EOFY Party Games. We provide a professionally hosted series of staff morale boosting fun engagement Min 2 Win It Games for all employees interacting in Sydney, Blue Mountains, Central Coast, Gold Coast, Surfers Paradise (home of the Commonwealth Games) and Brisbane. How long is required for the minute 2 win it team games? A minimum of 1hr is recommended. Generally 1.5-3 hrs of excellent fun is guaranteed. Exciting Minute 2 Win it team activities are custom built to suit every space suitable for both for indoor team building activities and outdoor team building games. The games thrill participants in a series of exciting upbeat Minute 2 Win It activities that bring out your team and individual competitive. Superb laughter and enjoyment for office and indoor team building to celebrate interactively with staff. Wet Weather? We’ve got you covered with Minute 2 Win It games great for a back up plan to your Amazing Race or Treasure Hunt. Thrill corporate entertainment games are superb for to break out from conferences, meetings and functions. We provide you a mobile service we can package your Thrill event with a DJ, lighting, entertainers, dinners and drinks in any location. Or directly in your offices, boardrooms or in a nearby pub or park. “excellent, fun, interactive, revealed “hidden” talents. There really is something for everyone. Get ready for an explosion of…. laughter! Where participation is as much fun as watching your colleagues and friends battle it out! 100% interactively. Team competitions are outshone by the skills of participants who master the activities Thrill present. Thrill Minute 2 Win Games are superb as a stand alone event or integrated into a rewarding evening or conference break out team building activities extravaganza. Professionally host all styles of corporate entertainment evenings. We suggest a Mix n Match with Trivia, Casino Nights, Giant Pictionary, Giant Scattergories and awesome games for all to participate in. Included is professional Hosting, MC’ing and unbiased Judging. We select the 10 best indoor team games to match your timing space and staff. Here’s a sample of some of the most popular. Moving on Up – 40 cup stack Elevator, which are lifted with alternate hands and re-stacked to bottom raising the marked cup to the top of the stack within a minute 2 win it! Stack Attack – 80 cups placed on the Table, teams must stack the cups to make the highest and most stable tower. Pencil Flip Out – Yes flip and bounce the pencil to land in the shot glasses. Bottoms Up – No not your bottom, the bottom of the glass. Bobbo head Banger – with pedometers measuring your count repeated say yes and nod your head to score the highest. Scrambler – Using the cards make as many scrabble words possible in 1 minute. Facially Aware. Face the Cookie. Move an Oreo biscuit from forehead to mouth. Look mum – no hands! Card Ninja – flick throw or flop cards. Do you Measure Up. Roll Ping Pong balls along a measuring tape, testing the balance, coordination and focus of staff under pressure. Let us know your favourite staff party games and we will replicate the activities for your group. Thrill event staff travel to all locations and venues with a professional multi-media presentation. Enjoy fun activities and skills that you can do in 1 Minute. With implements that you would find around the office or home. Ideal for large corporate groups to be entertained with lots of colour, fun, pace, rewards and something that everyone can do regardless of culture, departments or location. Hilariously engaging team and individual games and activities that bring out the skills of your colleagues that you never knew they had. Get on-board to enjoy professionally hosted hilarious corporate evening entertainment “Minute 2 Win It” style event. The games are timed to integrate catering, dinner and drinks packages. OK Google, give my team the best team building activities in a minute to win it. It’s that easy. Call Thrill on 02 9630 2222 to supply many minutes of fun corporate entertainment crews for conference breaks, staff off-sites and office game activities!